Resolving the script’s directory in bash so that it can access other resources its directory. (Or foo.bat – I prefer the *.cmd extension because this isn’t MS-DOS we’re running here). Firstly, finding a batch file’s location is similar to how it’s done in Unix: it’s the first argument to the script. So in our case we use %0, and we can extract parts of the path like so: %~dp0 will extract the drive and path from argument 0 (i.e. the directory). See the for command for more information on this funky %~ syntax. 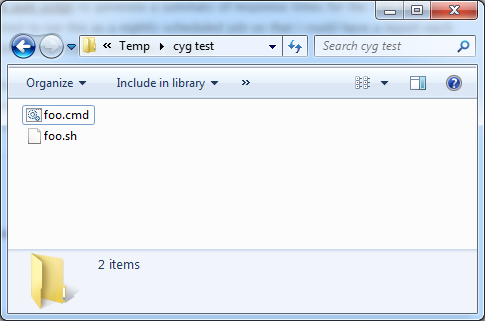 Secondly, the translation from a c:windowsstylepath to a /unix/style/path is done by Cygwin’s cygpath command. We do this in a slightly roundabout way via the ever versatile for command. Thirdly, arguments passed to a batch file can either be accessed individually using $1, %2, $3 etc, or all in one go using %*, which is what we use here. In addition, so that we don’t litter the Cygwin environment with temporary variables that we’ve created, we use a little setlocal/endlocal trick. Note that you just name this the same as your shell script with a .cmd or .bat file extension. and then just execute it as normal. echo "Hello from bash script $0"
echo "Working dir is $(pwd)"
echo "arg 2 = $2"
Remove the “@echo off” at the top of the script to get a better idea of what’s actually getting executed. Thanks! This was exactly what I needed and works perfectly! This changes the working directory to the directory it is called from. I wrote a .sh file I used to handle a combination of wget and awk which took some variables from files in the directory, if the files do not exist it would make them and set defaults, and then called the same script from different project directories (most of my work is the same, only with different names here and there). Before I would work with two or three command line consoles open, at least one cygwin and one cmd. However, the first time I used you script I put it in a folder in my %PATH%, and each time I ran it the sh would run from my home (~/). This is the fix I found. and can’t get it to work, for directory d:\dir. It’s clearly trying to cd to /cygdrive/d/dir but this is a cygwin command and not a dos command.